Taliban massacre children at school Jump to media player Militants from the Pakistani Taliban have attacked an army-run school in Peshawar, killing 141 people, 132 of them children. 'Hundreds of parents' waiting anxiously Jump to media player A spokesperson for the Red Crescent says things are 'critical' at a Peshawar hospital but they were managing to deal with the patients. 'Attackers entered every classroom' Jump to media player At least 100 people, 80 of them children, have been killed in a Taliban assault on an army-run school in Peshawar, Pakistani officials say. 'I was hiding under a chair' Jump to media player The BBC's Shaimaa Khalil reports from a hospital in Peshawar, where one injured boy describes how he hid under a chair to escape an attack. Taliban attacks in Pakistan - in 60 secs Jump to media player Tuesday's Peshawar school massacre was the Taliban's deadliest attack in Pakistan, as BBC News explains in 60 seconds. Militants from the Pakistani Taliban have attacked an army-run school in Peshawar, killing 141 people, 132 of them children. Officials say the attack in the north-western city is over, with all the attackers killed. Some of the children managed to escape. Others hid among the dead bodies of their friends. 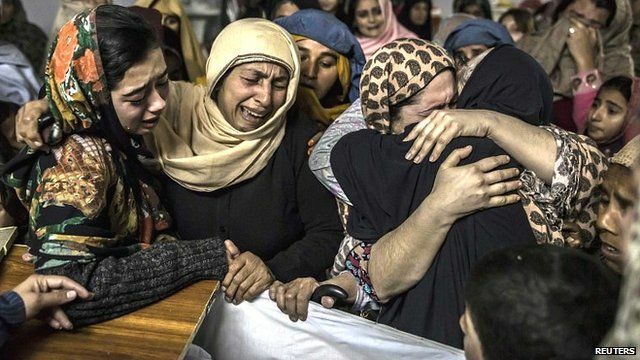 The BBC's Shaimaa Khalil reports from Peshawar.